to flaunt that terrier attitude!! "We interrupt your regular programming to give you an update on the SCOTTIE OLYMPICS, now being held in Aberdeen, Scotland! We now take you to the Pairs venue at the Ice rink. Take it away, Scottie!" "Scott Terry, here.... along with Percival Puhdul. We'll be giving you an update on this hotly contested pairs competition. Percival will provide us with the professional's view of the pairs. "Let's go directly to the ice.... the pair from the Highlands has just taken the ice. Percival, give us your impressions." "Thanks, Scott. Well, this pair is definitely ready for this competition. Watch their speed as they build up for their first side-by-side jump. OHHH, look..... a perfect triple toe-loop...just beautiful. "Now, watch. This move they're about to attempt has given them a lot of trouble. He's had problems getting her UP into that star lift. After all, scottie lasses aren't as svelt as our Puhdul girls." "There he goes.... ahhhhh, a slight bobble getting her up overhead, but beautiful lines now! Just look at the exquisite line they're skating!!" "And, he swings her down gracefully, settling her gently to the ice... well, call ME surprised... nicely done!" 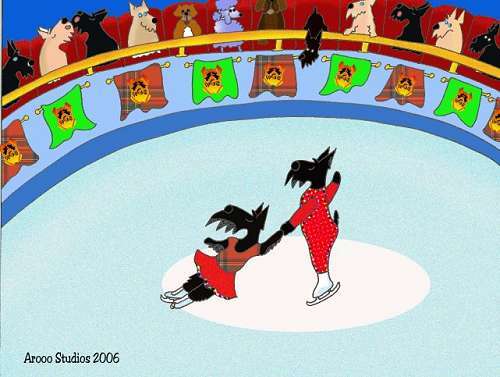 "Now, watch.... they'll end this short program with their signature footwork sequence... a Scottie Shuffle! It always brings the crowd to their feet, with all that ice flying!! Frankly, I'm not sure WHY they do that.... but it's been a BIG skating trick for them. The judges seem to LOVE it!!" "Thanks, Percival. Wow... the crowd is going wild! What a great performance this pair has given us! Let's see what the judges think. "Ohhhhhhhh, my..... "B+" for artistic impression, and a "B-" for techical merit. That does put them into first place, but will surely leave some room for the last pair to skate." "We'll take a quick commercial break, while the last pair warms up on the ice. Stay tuned to this station for more exciting updates on the Scottie Olympics!" "Welcome back. I'm Scott Terry. We're waiting for the last pair to take center ice. Percival, this team from Loch Ness has the potential to take gold here in Aberdeen. From what we've heard, these two are a mysterious pair. No one is quite sure WHERE they come from, but their skill can not be denied." "Yes, Scott..... and, as unlikely as it seems, these scotties DO seem to be quite light on their paws. 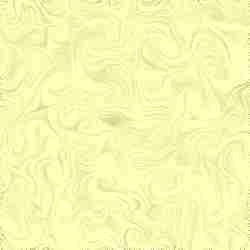 This pair has a very unusual program planned. They're skating to the "Arrooooo Aria" by Pup-ccini! Bizarre, to say the least!!" "We now take you out to Ben Nevis, Scotland's tallest mountain, where the hotly contested ski jump competition is taking place. What's the latest out there, Jack?" "Thanks. Welcome to the most incredible ski jump competition I've seen in quite some time. I'm Jack Russell, and I'll be your jump expert for this event. We're out here on one of the most lethal-looking ski jump towers I've ever seen. The scotties are scrambling right on up that monster tower. I just don't see how they're able to make these jumps. The wind is gusting now, almost to the point that the officials may cancel the remainder of today's jumps. That'd be a real shame, though, as there's a very spirited rivalry going on at the top of this jump." "We're down to the last two jumpers. The #1 ranked jumper in the world is at the top, watching the flags, trying to wait for a little help from the wind. He's sitting on the starting board at the top of this enormous hill. It's quite a site,actually, as his legs don't even reach the ground. He's going to have to JUMP off the board, just to BEGIN his run!" "He's OFF! Look at that form! He's flying down this hill....reaching the take off point. It's critical that they hit just the perfect take-off spot, to get the most distance down the hill." "Ohhhhhhh, he jumped early! He didn't get the spring from the end of the jump....ohh, I'm afraid this won't be his best score. He won't be happy with this at ALL!" "Yeah, he's short. But, a nice landing. Look at his form...legs bent to absorb the shock, front paws up to get the form points." "Here come the score.... 86.5%! Ohhh, he won't be happy with that! A C+!That will surely leave a LOT of room in the rankings!" "Okay, let's move our attention back to the top of the hill. We have one last scottie to jump. This lad has quite the reputation. He's known to throw his toys down the jump ahead of him, just so he can chase them to the bottom!" "There he is...sliding out onto the launch ramp. Ohhh, my......what attitude this Scotsman has. He's waving to the crowd at the bottom of the hill....he's blowing kisses! The official just leaned over and whispered something to him." "WAIT.... he's pulling something out of his suit... a TENNIS BALL?? He's handing it over to the judge! He's had his toy confiscated!" "Ohhhh, he doesn't LIKE to be told NO! We'll have to wait and see if this affects his jump!" "Okay, he's scooted over into the center of the board. THERE he GOES!" "He's really attacking this jump.....he's FLYING down that hill.....approaching the end of the jump, he's getting ready...you can SEE him coiling for the spring!" "WOW! He EXPLODED off the end of that jump!" "Incredible.....he's STILL airborne!! OHHHH, my GOSH! He's flown PAST the landing zone....and is just now coming down... on the FAR side of the bleachers!" "Looks like he's going to land over near the hot chocolate concession!!!" "Absolutely incredible! He COMPLETELY overshot the landing! And, look at THIS! He's receiving a 105% for his jump! They gave him BONUS points for distance! An A+! That cinches the Gold Medal, for sure! Well DONE!...... and LOOK! He's getting a complimentary cup of cocoa from the hot chocolate concession! Nice perks, when ya can get 'em!" "Well, that's all for now from the ski jump venue. It's really been a HOT competition, to be SURE!" "Stay tuned for more excitement from the Scottie Olympics!" "We're standing here with the coach of the Scottish Highlanders Skeleton team, R. U. Knutts. Now, the audience has probably never HEARD of this event, R.U. Would you explain the components of this sport for us?" "Sure, Labby, I'd be glad to. It's actually quite simple. The scottie has a sled, that has to meet certain requirements, weight, size, etc. The judges even check to make sure the runners aren't heated prior to the run, so they check the temperature of the runners!" "R.U. Knutts... you're kidding, right?" "No, Labby, sure not! The scottie gets a running start...then lays down on his sled, face FIRST, as he flies down the course at speeds up to 80 mph! His face is mere inches from the ice. It's quite exciting!" "Yes, indeed! And we have the top Skeleton sledder in these games. We expect great things from Baldy Bardoche! We expect him to set a new Scottie Olympic record. He'll get a lot of competition from the Aberdeen champion, though, so we can't celebrate YET. We'll have to wait and see how the sleds run." "Wow, it sounds really exciting, R.U. We'll let you get back to your team. I see that the competition is just about ready to begin. Good luck." "Let's go now to trackside to watch these sleds make this treacherous run. The first sled is just about ready to start. He's pushing it back and forth... one last push, and he just PLOPS down onto that sled! WOW...... look how close he is to the ICE! His beard's actually dragging on the icy track.....that MUST be dangerous! OHHH, he's high on the Widowmaker chicane, that'll make it almost impossible for him to recover enough to make it through Terrier Turn." "OUCH!!! He blew straight through that turn. His sled went right up over the side. Too bad, but it looks like he's okay. He's up, and shaking himself off." "Okay, the next sledder is at the top of the run. Let's watch." "Start looks good...he's much faster onto the sled! Ohh, and he's keeping his chin up! Bet he's learned that from experience....keep that beard away from the ICE! 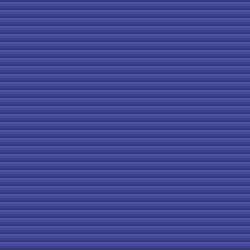 Wow, he's slipping right through the chicane, no problems there, and still picking up speed! Uh oh, he bumped the side going into Widowmaker, that'll slow him down. Yeah, he's losing time now!" "DID you SEE that??????? He was PUSHING with his back paws!!! I'm SURE he did! Back paws just pushing as hard as they could!!!! That's illegal, isn't IT?? He was PUSHING! Ohhhhhhhh, we'll have to get a ruling on THIS! Yeah, the judges are pointing and waving their paws at him. That'll disqualify his run, for sure!" "Let's go back to the top. R.U. Knutts' champion sledder is about to start. He's rocking the sled back and forth..building up speed. This scottie is built like a cinderblock! He's solid! I don't know how this would help him....he doesn't look like he's built for speed! But, R.U. Knutts says he's awesome! We'll see." "He's pushing off.....and has belly-flopped onto his sled. Not stylish form, by any means...let's check that speed. He's really accelerating!" "Wow, watch him lean into that s-turn...a beautiful line! OHHH, my goodness! He almost fell OFF the sled! He leaned too far over, coming off the Widowmaker turn... just BARELY held onto that sled!" "Can you hear his coach?" R.U. Knutts... "get back on that sled!" "That really got his attention. R.U. must really wield an iron paw with his team. He's centering back onto the sled, gaining speed now..... can't believe that he's making such great time after that near-disaster!" "Coming up to the last turn, a wicked 180 degree turn that has thrown almost half of the sledders right off the track. Here he comes, he's got too much speed, he'll never hold that turn!" "He's high in the turn.....that runner is almost over the TOP of the course.....he's never going to stay in the groove! I can't believe it.....his sled just ricocheted right down into that last chute! He's crossed the finish line, and is digging those paws into the ice, slowing himself down. " "FOLKS, you won't believe it! He's broken the Scottie Olympic record! He's taken the GOLD medal! R.U. Knutts is congratulating him. The entire team is celebrating! What a spectacular win!!!" "We'll take a break and go back to the studio, to get an update on the other venues happening here in Aberdeen." 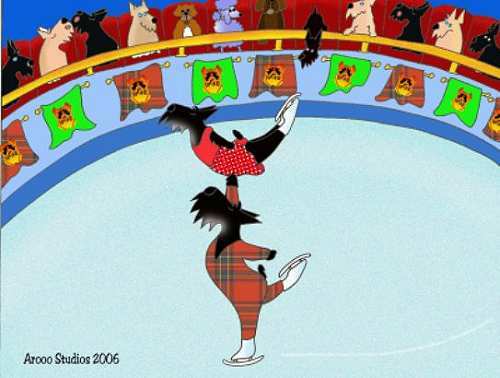 "Stay tuned...... there's a lot more excitement to come.....at the Scottie Olympics!" "Welcome back to the non-stop action here in Aberdeen Scotland, where we're covering the thrills and excitement of the Scottie Olympics." 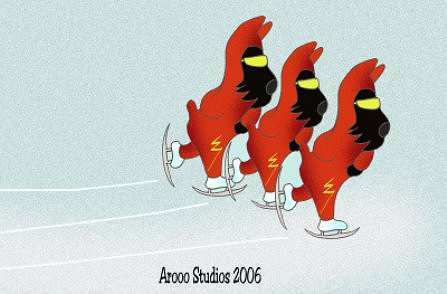 "I'm Zippy Powerpaws, here at the Speedskating oval, where we're about to see some of the most incredible skating you'll see at these Scottie Olympics....the Team Pursuit!!" "For those of you who haven't had the joy of experiencing this type of race, the goal is to win the race. However, your team's TIME depends on the entire team! Every member of the team must cross the line before your time is official, so this race hinges on each team's weakest member! A thrilling race, to be SURE!" "The preliminary races have been run, and we're down to the finals, both vying for the Gold medal. The top two teams in the world have made it to the finals, but the edge must go to the Highland Hurriers. They've got the two fastest speedscotties in the world on this team, so we'll expect them to make a serious challenge for the Gold medal." "The teams are lining up, and it DOES look quite crowded out there. But, that'll bring a lot of excitement at the finish." "Okay, the officials have the teams at the starting line...they're all braced...and they're OFF! It's quite a scramble right now, as they all gather speed and try to gain the advantage going into that first turn." "Ohhhhhh, a stumble! Team Bushy Beards' lead speed scottie stumbled! He's really having to scramble to try to catch up to his team! That'll put a LOT of pressure on their slower scot...he can't afford to let them down!" "Look at these teams as they get into a rhythm.....bent low, one paw resting behind the back... beautiful form!" "These laps are really threatening to break the Olympic record here! Watch as they finish this lap. My goodness, these teams haven't stretched out at ALL! This will be an incredible finish!" "Ohhhhh, there's the bell....they're starting the last lap. It'll pick up now! Look... they're really pouring the speed on now!" "WAIT!!!! What's he doing??? The team captain for the Highland Hurriers literally stopped!!! He bent down, and tried to pick up one of those round, yellow markers that separates the ice lanes. What in the world is THAT all about?????? He's throwing away a MEDAL....most assuredly!" "I simply can't BELIEVE this!" "Ohhhh, my goodness! His teammates came BACK for him...one grabbed his paw and has PULLED him back onto the track!" "They're really moving now!! But, they'll never recover from THAT!" "The Highland Hurriers are growling....low in their throats! And LOOK at the reaction of the other scottie team! They've stopped!" "This is incredible! Look at Team Bushy Beard...they're all standing, feet braced...turned back toward the fast-approaching Hurriers! They're WAITING for 'em! I wouldn't believe it if I wasn't witnessing it for myself!" "This is going to be one VERY strange race! WATCH... the other team has turned and resumed the race, just as the Highland Hurriers rounded that far turn. This WILL be a close finish!" "Look how LOW on the ice those scotties are! They're truly aerodynamic...those paws haven't BUDGED from their backs...and those expressions! They're certainly determined!" "Here they come...they're closing on the finish line. They're not going to come CLOSE to the Olympic record...but I guess that wasn't important to the scotties." "Boy, the Highland Hurriers have had to make up a LOT of distance. Their captain is STILL at the back of the group! They're having to WAIT for him. They're the existing world champions, and they're NOT going to win the gold here..... incredible!" "The Bushy Beards have PASSED the current world champions!! They're going to win GOLD!!! They've beaten the Highland Hurriers! What a FINISH!!!!!!!" "Look at the Bushy Beard team. They're delirious, they can't believe they won!!!" "I will have to give it to these teams, though. Good sportsmanship, to be sure. The Highland Hurriers have moved over to congratulate the Bushy Beard team. How gracious...."
"WAIT!! What's that?? The Hurriers' team captain had something round and yellow in his paw, showing it off to both teams. They're all laughing!!!" "We WILL get to the bottom of THIS! There is MORE to this story than we know. We'll keep you POSTED!" "This is Zippy Powerpaws. While we go investigate this new bounce in the story, we'll send you back to the studio, for the latest in the other events here in Aberdeen." "Stay tuned to this channel for more excitement at the Scottie Olympics." "Yooooo, DUDE! I'm Scrungy Droopydrawers, gonna 'splain whatcha gonna see out here today." 'We're chiln out here at the 'pipe, to watch some awesome snowboarding. These dudes really know how to throw aerials on these sticks!" I can guarantee ya won't see any of these dudes sluffin off...nothing tedious HERE! Gonna see some radical tricks here on this gnarly superpipe! "We've got two dudes left to run the 'pipe. Both are extreme boarders, both love to hang 20... gnarly!" 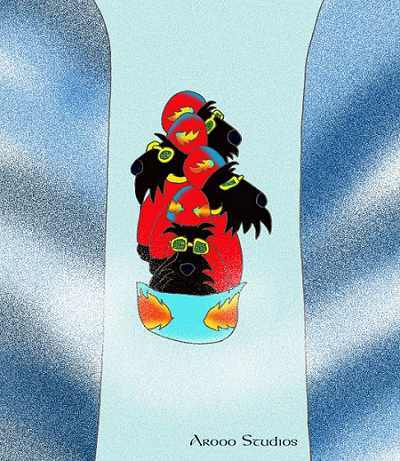 "First dude is at the top of the pipe. It's 'Stickler' from the Highlands team. This sure won't be a cruiser run for him! He's coming down the lip... wow, he threw a 520 right off the top! Awesome!" "Now watch....'Sticker's' known for his ollie. 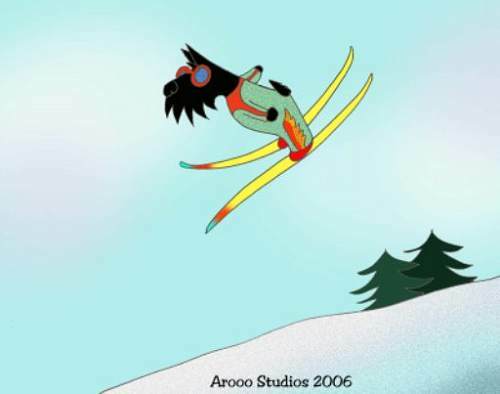 'Scuse me, he lifts the nose and tail of his board off the snow at the same time. THERE!" "Awesome! That ollie was HUGE..... and he went straignt into an inverted 720! He musta boosted 10 feet out of the halfpipe! That's SICK!!!!!!" "Dude!!! Stickler's really an airdog today! And look for a double inverted McTwist at the end of his pipe run...THERE it is! And he didn't bail on it...SICK!!!!" "Yep, he always throws that huge rooster tail of snow at the end of his run! That's one really radical dude! LOOK! He's scoring A minuses, across the board! Radical!!!" " This leaves just our main man, 'Bingo'. He's famous for throwing three 360's in a row.....never, ever bails on 'em, either! That's radical, dude!" "He's coming off the top. Awesome... he's burning up the pipe! He'll throw an Alley Ooop right off the lip. THAT's it...there! Radical!" "And went straight into a 360 air to fakie! Now watch....he'll revert back to normal, then slide right into an inverted 920! Gnarly!!!!!!!" "Wow....watch...he's throwing a 720 with a nose grab here at the end of his run! MAN, he busted that flip without bailing! SICK!!!!!!!!" "Dudes, this will be TOO close to call! Bingo did some sick tricks, and Sticker threw some radical air. We'll have to hang out and chill 'til the dudes with the computers figure it out!" "WOW..... Sticker has taken the gold, by 0.004 points!!! That's SICK!!!!!" "Call me blown away, dudes! Sticker's got the gold medal!" 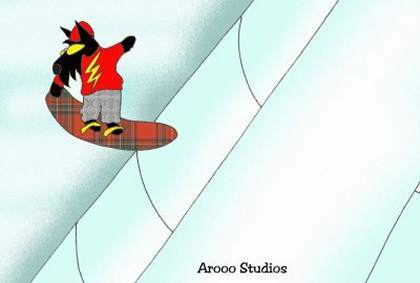 "Well, this is Scrungy Droopydrawers.....we've had some gnarly tricks thrown here at the pipe. We'll send it back to the main man at the studio." Don't ask me what it means...CLUELESS! And ya thought I was ALL-knowing, HUH!!!! "Welcome back to another thrilling afternoon of speed on the ice. The excitement here at the bobsled track is electric!" "We've seen some amazing runs today.... and some really frightening spills! 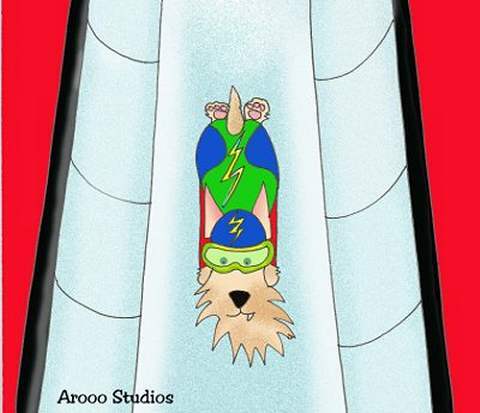 The scottie team from Lower Splechlineighs went over in the s-turn and finished the race upside down!" "However....the BIGGEST news came just moments ago!!!!" "The current holder of the world record time, the Terrier Tornadoes, had just pushed their sled up to the starting line, and were preparing to make their run." "We had wondered why the Highland Hurriers, currently ranked #2 in the world, just BEHIND the Tornadoes, had pushed their sled up behind the other team. We thought they were just eager for THEIR run. No one seemed too terribly concerned about it. All eyes had been on the T T team, as they're known for their explosive push starts." "The Terrier Tornadoes had pushed off, a super start.....and had leaped into their sled, snapped the pushbars closed, and tucked their furry heads down for what they'd hope would be a lightning fast run." "THEN, it happened! The Highand Hurriers' sled jerked and sped off down the track, right behind the T T sled!" "Everyone was STUNNED! The track judges were speechless! THEN, someone noticed it!! The Hurriers had attached a BUNGEE cord to the back of the Tornadoes' sled!! The Highland Hurriers were being DRAGGED down the track by the hard-driving Terrier Tornadoes!!" "The Tornadoes must have FELT the drag on their sled. Their heads came up, and they began looking for the source of the problem. They then noticed the bungee cord tied to the back of their sled, and when they turned around, they saw the Hurriers' sled, speeding along the track, less than 6 feet behind their OWN sled!" "Now, that, in itself, angered the Terrier Tornadoes to the boiling point. But, the Hurriers rubbed salt into the wound. When the T T team turned to look at the Hurrier sled, the H H scotties actually WAVED gleefully!!!!!" "WELL... things quickly progressed from bad to nightmarish! The Tornadoes tried desperately to untie the bungee cord, but dragging the Hurriers' sled had tightened the knot. 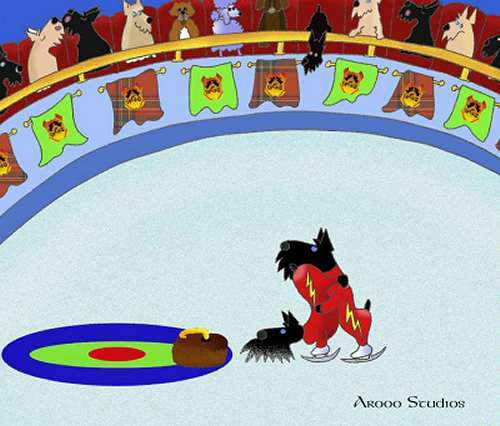 Add to that, the fact that the second sled's scotties were heckling the Terrier Tornadoes quite badly. The Tornadoes' brakeman hit the BRAKES, sending the lead sled into a wicked tailspin." "The Hurriers chose THAT moment to break free. They cut the bungee cord and ricocheted past the out-of-control Terrier Tornado sled, maneuvering wildly as they raced away down the track." "The Terrier Tornado team finally regained control of their sled and managed to finish the race. Their sled careened into the back of the Hurriers' sled that'd just stopped at the snowbank at the far end of the track." "Suddenly, the bobsled competition turned into boistrous bedlam. Two teams accusing each other of all sorts of irregularities... everything from 'they used our sled wax' to 'they called us SLOW'!" "The bobsled officials have just concluded their investigation. It seems that BOTH teams are to be held responsible. The Terrier Tornadoes DID tell the Hurriers that they'd never be able to even FINISH a run, that the only way'd they'd EVER make it down to track would be to hook a tow-rope behind the T T sled and follow THEM down the course! Enough to disqualify the Terrier Tornadoes!" "The fact that the Highland Hurriers took the Tornadoes up on their SUGGESTION, was enough to get THEM disqualified." "The media was all prepared for a 2-team free for all, expecting both teams to take their anger out on each OTHER! But, there's no way to understand the mindset of Scottish Terriers." "The Tornadoes and the Hurriers, upon hearing that they'd BOTH been disqualified, stared at each other for a few moments.... then both teams broke into wild laughter, congratulating each other for maintaining something they were calling 'Scottitude'!!" "The last WE saw the Terrier Tornadoes and the Highland Hurriers, they were all together, arrrroooo'ing loudly, and heading into Aberdeen, planning to convert the first PUHDUL they encountered! We'll have to find OUT what they meant by THAT!" "SOOOOOOOOO, the gold medal will be awarded to the 3rd place team, currently ranked #38 in the world! Amazing!" "Who said the Scottie Olympics would be DULL??? NEVER dull around Scotties, that's for SURE!" "We're here, at the FINAL event of these Scottie Olympics....at what has become the DARLING of these games... CURLING!" "The crowds have been huge, the teams have been superb, and we've all learned a lot about a sport that we didn't even know existed! The words du jour seem to be 'rocks', 'ends', 'button', 'in the house', and the crucial 'hammer'!" "We're down to the final game......the gold medal game, between the Highland team and the hometown Aberdeen team. It's been a very close game, and we've held our breath through the entire game." "We're down to the last 2 rocks of the 10th end. The score is tied, 5-5, and the Aberdeen team will have the final rock, the 'hammer'. They've had a spectacular game, and have taken some surprise points in the last two ends, to tie this game. They're playing an intense game, and it's exciting just to watch the team discuss their options prior to each delivery. They're a very electric team!" "The Highland team was surely taken by surprise in the 9th end, when the Aberdeen team tied the score." "But, they've not let it affect their game. They've been as steady as a.....well, a ROCK! They're landing each rock right at the button, and the house is packed with their guard rocks." "The Highland team is just about to release their final rock. My goodness, they're really studying the placement of this rock. Look at the intensity on those faces!" "For those of you who're just joining us, we need to explain one tiny difference in a curling match between teams of scotties. It seems that they have an advantage! Some of the sweepers refuse to use the brooms that are part of curling equipment, preferring to use their own beards!! Bizarre, to say the least, but it IS quite a spectacle!! Let's Watch!" "The Highland skip is in position. He begins his delivery. Ohhhh, it looks too strong. That rock may not... YES, it's beginning to curl. Incredible! It's knocked out the Aberdeen shot rock and is resting on the button! What a SHOT!" "Okay, here comes the Aberdeen skip. He and his team are discussing their strategy. Yeah, I like the line they're planning here. If they can take the rock in around that guard, then they can move the Highland rock off the button and TAKE this game. Looks like that's what they plan to do. They're ready... it's down to this one last rock!" "WOW.... what a soft release!! I don't know if that rock will even reach the 'four foot'. Now, WATCH the sweepers! 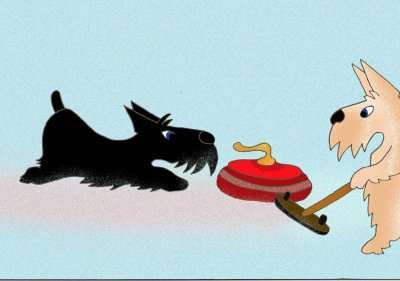 One Aberdeen team member is using a standard broom, but the other is using scottie beards to sweep the ice! Incredible! Look at that rock curl! It's easing right around those guard rocks and is... YES, it's dislodged the Highland rock......the ABERDEEN team has just won GOLD MEDAL!!!!!!" "Absolutely incredible! What finesse!!! What a perfect ending to the Scottie Olympics!" "Well, that concludes our Scottie Olympic broadcast." "We've watched thrills and excitement, we've cheered and laughed, we've been amazed and shocked! We've shaken our heads in disbelief, we've wondered if the Scottie Olympics would provide the level of sporting excitement we're accustomed to. And, to that, we say YES, Indeed!" "These Scotties have shown us that it's not the physical size of the scottie that matters. Rather, it's the size of the heart, drive, and determination in the scottie. We've discovered, in the last two weeks, that scottie spirit is unequaled. They've show us that their sporting adventures are treated the same way they live life... on their own terms!" "Thank you all for tuning in to share these Scottie Olympics with us. So, until the next Olympic flame leaves Mt. Olympus, we bid you adieu." This ORIGINAL story has been created and written by Carol Johnson . ©Copyright 2006-12 All rights reserved.